If Race Over The Glens is the annual curtain raiser to each new year then the Christmas Cracker in Castlewellan is the traditional way to see out the old one. Uniquely, this race requires athletes to run - and finish - in pairs and has long been established as a firm favourite in the calendar for Ballymena Runners. Run over road, trail and mountain the nine-mile course attracted a large entry from the club. First to cross the line in 36th place were John Hasson/John Robinson (1:11:58), followed by Jack McKenna/Mark Alexander 89th (1:18:02) and John McClelland/Daniel McClelland 106th (1:20:21). Other pairs competing were Geraldine Quigley with Larne AC's Paul Tilson (1:22:26), Linda Petticrew/Alastair Hill (1:29:11), Sandy McDermott/Neil Ramsey (1:40:06), Neil Purvis with Springwell's Bernard Hamill (1:42:15), Alastair Donaghy/David Rainey (1:45:50), Kathryn Grant/Aine Hasson (1:48:22), Helen McCormack/Gillian O'Boyle (1:52:22), Shelley Tomlins/Kelly Courtney (2:00:07), Hall Booth with Riada's Eddie Hampton (2:00:14), Gerry McClintock/Andrew Wylie (2:04:19), Jim Stewart/Catherine Stewart (2:09:25), John Neeson/Brigid Quinn (2:10:05), John Lilley/Teresa Mark (2:11:12), Beverly Kidd/Aidy Dodds (2:13:08), Noleen Ervine/Michael Wray (2:18:32), Emma Donnelly/John Watt (2:36:29), Mairead Agnew/Kate Dempsey (2:36:36) and Martin Harris/Judith Irwin (2:45:27). Runners from all over Northern Ireland made their way to the foothills of the Sperrin Mountains on Boxing Day for the 32nd annual Greencastle 5-mile Road Race. Over 1000 athletes descended upon the village for the local racing calendar Christmas Classic and, as you might expect, there was a strong showing from Ballymena Runners. John Hasson (30:54) led the local contingent home in 46th spot overall followed by Linda Petticrew (38:32), Aine Hasson (40:15), John Lilley (40:14) and Brigid Quinn (47:34). Congratulations to Brigid and Linda for coming 1st and 2nd in their respective age categories! A number of athletes earned their Christmas dinner on Monday with an appearance at parkrun in the morning. 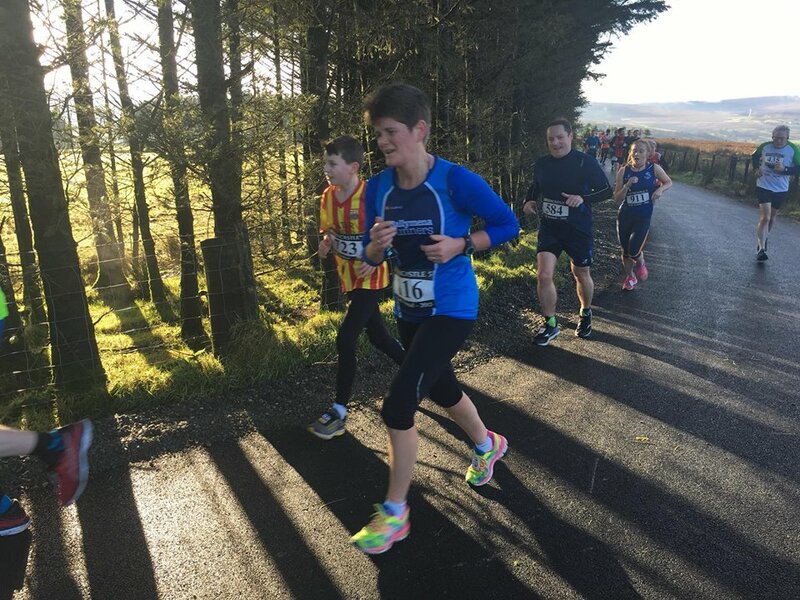 Although the planned local event at Ecos was postponed due to flooding that didn't stop Parveen Akhtar, Ryan Armstrong, Tim Hawksworth and Robin McClelland throwing on their trainers and getting out there to complete a festive 5k. Congratulations to Parveen who recorded a new course PB in Bradford while Robin clocked up his milestone 50th run at the Waterworks event in Belfast. Elsewhere, Ryan did well to finish 6th in Valley (Newtownabbey) with Tim just missing out on a personal best in Bangor. Meanwhile, on the previous Saturday, Jason Wilson finished first in Portrush for a remarkable 10th time. Indeed, of the 13 times he has competed on the East Strand beach he has never finished outside the top two. James Hamilton finished runner-up in the Belfast Victoria event while Rodney Livingstone came third in Limavady, setting a new course PB in the process. And, on the subject of personal bests, congratulations to Lorraine Craig (26:10) and Sharon Murray (34:37) on setting theirs at Ecos, while Teresa Mark reached her milestone 50th appearance. Santa and his elves took a little time out of their Christmas Eve preparations on Sunday to participate in the Leg-It Events Hazelbank Christmas Run. Setting off from Newtownabbey's Hazelbank Park, the 5-mile course hugged the Shore Road in the general direction of the Ulster University Jordanstown campus before looping back to finish in the park in the face of an, at times, challenging headwind. Ballymena Runners were represented at the event by Kim Close, Martin Harris, Bronagh McCormick and Grace Snoddy all of whom donned fancy dress for the occasion, and found it the perfect way to kick off the festive break.